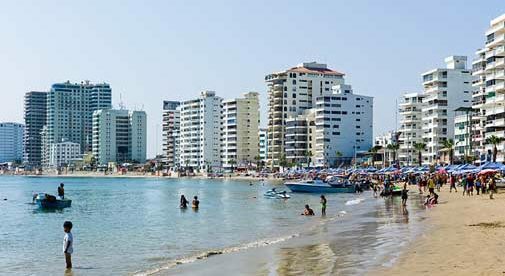 Learn more about Ecuador and other countries in our daily postcard e-letter. 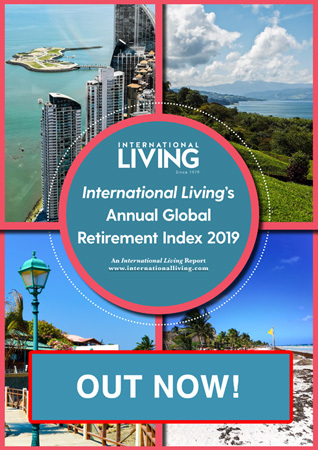 Simply enter your email address below and we’ll send you a FREE REPORT – Ecuador: Live Like Royalty on Your Social Security. Arriving in Salinas, Ecuador, one of the first things you can’t help but notice is the dazzling array of colors that paint the waters lining this relaxing coastal community. 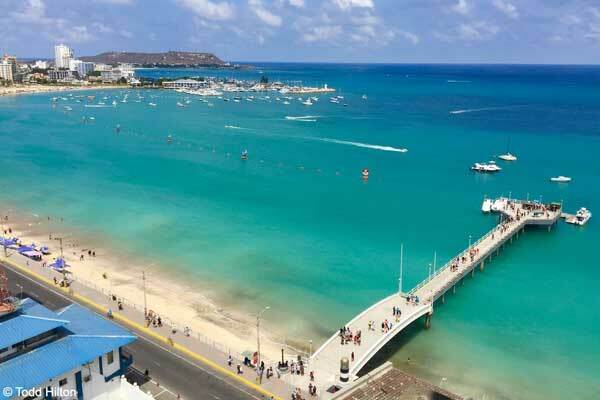 The aqua, teal and tur-quoise waters splash along miles of sandy beaches, letting you know that you have arrived at one of Ecuador’s special gems. Salinas is a beach culture through and through. From its beautiful beaches lining the malecón (boardwalk), to the ample choices of restaurants serving some of the freshest and most delicious seafood, there’s no denying that Salinas is an Ecuadorian destination that shouldn’t be missed. My partner, Damon, and I arrived in mid-January as part of our roving retirement, and we were treated to some of the most beautiful weather imaginable. With daily temperatures varying be-tween the upper 70s F to mid-80s F, we knew we’d found someplace special. While our friends back home were complaining to us of the freezing cold and pelting rain, we were applying sun-block and wearing flip-flops and sunglasses. The view of Salinas beach from Todd and Damon’s apartment. We found a wonderful studio apartment with all the necessities needed for a very comfortable way of life. With gas stove tops, a large screen TV with cable, a beautifully large walk-in closet, wireless internet, a washer and dryer, as well as a stunning view of the beach below with its bril-liantly colored waters, we felt like we’d found paradise. We are staying in a beautiful building that offers a concierge desk, pool, jacuzzi, weight room, and even a ping pong table, all for a price of $1,000 per month (including all utilities). While this may seem like a higher price than you’d wish to pay for an apartment, please know that we booked our stay during the peak season of Salinas’ Carnival celebration, but you would be able to book this same apartment for around $700 any other time of the year. A deal not to be found anywhere in the States. We are living right on the water, and within a short walking distance to all the main restaurants and attractions that Salinas has to offer. But we aren’t isolated from the great surrounding areas that are within a short taxi ride or even a bus ride. If shopping is what you like to do, then pay 30 cents to hop on one of the many local buses leav-ing for the neighboring town of La Libertad, and you’ll be treated to its many huge outdoor mar-kets that offer anything from fresh fruits and vegetables, meats and seafood, to clothing, shoes and home goods. While shopping with our friend (and IL Coastal Ecuador Correspondent) Jim Santos, he bought four pounds of large, cleaned, shelled shrimp for $16. We bought ourselves some bags of huge bell peppers and a bag of beautiful red onions, going for 50 cents each, and before we knew it our arms were filled with bags of fresh produce for just a few dollars. Then we hopped back on the bus and were back in Salinas. A day of travel and shopping all for under $10, and memories that money can’t buy. If you’re interested seeing a movie, hop into a taxi for $2 and head over to the local El Paseo Mall and enjoy a first-rate Hollywood movie in English (with Spanish subtitles) for two, with popcorn and a drink for around $15. That’s a bit more than the cost of just one movie ticket back in the U.S. With activities like this, there’s always something to do. The weekends in Salinas are a time for fun and letting loose, and you can best believe that there’s always something happening that reflects the Ecuadorian people’s love of celebration. From daz-zling fireworks exploding into a starry night sky to the music pouring out from the many bars and restaurants lining along the malecón, weekends are a time to party. Then Monday rolls back around and the once-lively town returns to its quiet relaxation. It’s truly the best of both worlds. We discovered after two months of living in Salinas that we were able to keep within our budget of under $1,800 per month, and we couldn’t be happier. The draw to Salinas is its gorgeous beaches and its comfortable laidback lifestyle, but it’s the low cost of living, constantly comfort-able weather, and the warm and friendly local community that will bring us back again and again.